Gerontocrat, bear in mind that Tealight's project deals only with snow extent, not thickness/SWE. No my big project is to calculate an albedo warming potential from the snow cover data with consideration of vegetation. The snow daycount map was just a small thing I felt like doing in the mean time. It took maybe 2-3 hours including all the visualization refinements. I already had most of the nessecary code from my sea ice analysis. When I feel like it I will also calculate snow melt days and snow fall days. I don't know exactly how yet because in the mid latitudes snow falls and melts several times a year. Could be an interesting analysis, but you would need to seperate at least the continents. European snow is far further north than in America. I wonder if you could explain your biome map to some extent. 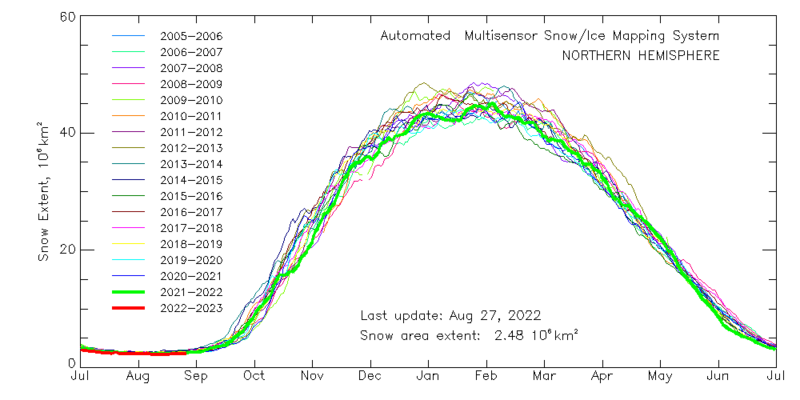 When you look at the snow extent in August/September, you see that snow extent was well above average (and even well above one sigma above average) in the 'flat' time during the summer of 2018. Was there a particular area of snow that failed to melt out during the summer of 2018 ? Or is this some anomaly in the measurements this year ? I would think it was due to CAA retaining full summertime coverage in many spots, as well as the Western Himalayas having +coverage v. normal. Could it be that Environment Canada is just off ? Does anyone know which data source they use to determine snow cover extent ? EC actually does manual / human map output based on multiple satellites. NSIDC and Rutgers are strictly satellite pixels. The EURO is probably the most accurate but IDK where that data can be found. f you posted links (e.g. a link to these graphs) it might help. Also: I think these graphs show something very interesting happening. 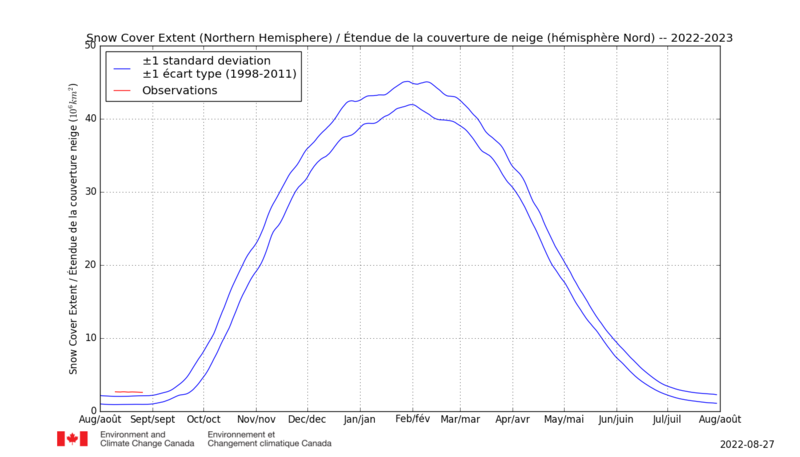 The Northern Hemisphere trend is sharply positive since 07-08. But North AMERICA has been trending positive through the decades, slowly but surely (rather, the trend in NAmerica has been more consistent, especially in recent years, when it has begun outpacing Eurasia -- not the case previously). It looks as if snow-mass-balance (and extent) is shifting towards Greenland (i.e. North America) which makes sense as it is the largest extant ice sheet remaining in the NHEM, and the Arctic Ocean is increasingly the un-Arctic, prohibiting Greenland airmasses from flowing as freely as they used to across to Eurasia. I wonder if this is also partially due to local feedbacks to Eurasia (+methane from ESS etc, and melting permafrost everywhere else in Siberia)?? the reason to post anything should be to share information and discuss possible solutions and workarounds for the problems at hand. seeking fame (credits) is exactly why projects, even with the right goals in mind originally, start to fall apart as soon the worst is over to simply build up a new flawed system. this applies to everything, not only climate risks. You would get much more credit for focusing on important snow issues if you didn't insist on confounding this with impending glaciation. bbr2314 post #5 (out of 1515). The only change is the expected timespan. Down from a few centuries to... next week? The Hansen maps show declines in temperatures surrounding areas affected by the NATL cold pool, with anomalies increasing (in a negative direction) as the Greenland melt accelerates. Could the lingering Hudson Bay ice and the very cold Quebec this summer also be a result of this, and if the positive feedback continues accelerating, perhaps it's possible that higher elevations of both Scotland and Quebec see re-glaciation over the next few centuries, while Greenland gradually melts out? On topic: Snow cover being more than 1 standard deviation off compared to historical data - is that such a big deal? For a normal distribution only 68% of the samples are expected to be within +/- 1 SD. If the trend over the years is positive even more samples would be expected to be over +1 SD. If the Younger Dryas is an indicator it could occur within a decade. Perhaps the 70s were such an occurrence, aborted by +GHGs / abrupt end to -insolation due to SO2. Now we pay the piper? IDK. I think the two issues are inextricable. Greenland gained mass balance this year (so impending glaciation is now actual advance, at least for Greenland). How can people reconcile +GHGs at some ridiculous # vs. the last mass gain in Greenland (1972) versus the current state where the same is occurring if glaciation is not impending? It does not matter if this glaciation lasts a few hundred years -- we will all be dead by 2100, that is the relevant timeframe. sounds like a Trumpette ..
Greenland gained mass balance this year (so impending glaciation is now actual advance, at least for Greenland). It is possible that Greenland gained mass in the Sep 16 to Aug 17 year, as surface mass balance (SMB) increased by more than 200 GT above average. It is possible, but less likely, that Greenland gained mass in the Sep 17 to Aug 18 year, as surface mass balance (SMB) increased by about 150 GT above average. But we do not know the extent of mass loss from calving as there is no GRACE data. Therefore your statement is a maybe, not a fact. We may have new GRACE data from January 2019 to tell us the change in Greenland's mass from early 2017. Meanwhile, as far this the 2018-19 year's snow-cover is concerned, (the subject of this thread), the snow in North America is above average all studies predict as the long-term trend, but not totally out of wack. It looks possible that for the next few days, snowfall in North America will be not so much, and extent may go down a bit as relative warmth replaces relative cold from West to East. And here is the quote from https://nsidc.org/greenland-today/. Definitely a maybe. The net change in (2018) mass of the ice sheet overall, including this higher discharge of ice directly into the ocean, is not clear at this point but may be a smaller loss or even a small gain. This is similar to our assessment for 2017, and in sharp contrast to the conditions for the preceding decade. Greenland is not heading towards glaciation. It is melting. This is scientific fact. And there is no evidence to suggest the loss of ice will stop. A few years of little gain mean nothing in a downward trend. Weather is not climate. With all do respect bbr, come back in 10 years with clear evidence that support your claims, because the current science of climate science does not. Meanwhile - back to snow. An interesting 5 days ahead in N.America. While most of North America looks like being almost free of snow, Storm Diego seems due to dump a load of snow and ice all along the southern plains and the Appalachians. Being that far south and this being early winter, will it stay or will it melt afterwards? Update on the monthly Rutgers NH snow anomalies. Like the past couple of years, November saw another positive anomaly. Extent was 37.77 million km2, which is an anomaly of +3.81. Positive anomalies came from much of North America and Kazakhstan. Negative anomalies were over much of Europe/Western Russia and Mongolia. Just a .... little bit... of snow coming to British Columbia... liquid equivalents of 10"+ in spots and only through D6-7!!! Note that the quote below is about Arctic snow at 60+ North, i.e. excludes snow at lower latitudes. North America Snow Cover Extent stalled again, though snow water equivalent still increasing. Looks like extent could retreat north as warmth spreads across from West to East. Awesome, Nico. That regional mask map looks just like the one for Arctic sea ice. Meanwhile, the anomaly in the south of North America should get pinker as warmth heads North in central and eastern N.A. and disposes of thin snow cover. Starting to show in data from https://ccin.ca/ccw/snow/current as at 13 Dec. The regional breakdown is beyond perfect. Thanks. After a few hours of coding and 1.5h of calculation the AWP and AWP_anomaly data for the Northern Hemisphere is ready to be explored. For eastern Canada, the most discussed Region here I already made two charts of the mean anomaly for April and May. That will take some time to get through and find all interesting parts. I hope some forum members can explore it too. The data is available as usual on Google Drive and now also on Github. That will take some time to get through and find all interesting parts. I hope some forum members can explore it too. The data is available as usual on Google Drive and now also on Github. I will try and boldly go where only Tealight has gone before. Snow Cover Extent (SCE) in North America has declined sharply to around average as warmth heads north and east across the centre and East. This looks like continuing for a few days more. However, Snow Water Equivalent (SWE) continues to increase and is at somewhat more than +1 SD. Looking at the 2017-18 snow season, it was SWE that went up beyond reason in Feb and March 2018 mainly due to a procession of North Easters dumping vast amounts of snow on N.E. Canada, SCE over North America in that period was well above normal,but not to the same extent. I think Tealight has got his timing for getting his project on the street just about right. Thanks for helping out I would say its a year too late. Not only did we have major arguments here about albedo, but I also need to take a long break from Climate Science research. It's not so much of a time issue, but I need all my concentration and analysis power for my day job. Anyway, the Near-Real-Time AWP page (soon daily updated) is coming along, but I'm not sure on the main graph. It's supposed to compare major Regions of the world. Canada and the USA are each large enough to put them into the same category as Europe, but the southern USA has almost never snow cover (see atached map) and is more similar in latitude to northern Africa. So for now I have excluded the two southern US regions. Apart from high altitude Tibet all other regions extent to around 35 degrees south. Can you possibly change the US / Canada regions and divide them based on the Continental Divide? It has typically served as the demarcation between cold & warmth across the continent so having regions that it splits as a cohesive whole likely undermines the purpose of AWP (IMO). I would also think it better to combine eastern Canada / Northeast US as one region, and the Midwest US/ western Canadian shield as another, instead of Canada vs. US. The decline in Snow Cover Extent (SCE) in North America is looking like maybe an event is unfolding. SCE has declined by about 1 million km2 in the last 5 days or so to below average as warmth headed North and East across the centre and East. This looks like continuing for a few days more. Snow Water Equivalent (SWE) also stalled on this day at somewhat more than +1 SD, and precipitation looks like being quite low over the next 5 days, and may fall as rain on the far NE seaboard. Looking at the 2017-18 snow season, it was SWE that went up beyond reason in February and March 2018 mainly due to a procession of North Easters dumping vast amounts of snow on N.E. Canada. SCE over North America in that period was above normal, but not to the same extent. That will take some time to get through and find all interesting parts. I hope some forum members can explore it too. I created the Rockymountain region specifically to cover the high altitude region, similar to Tibet to analyse snow cover change at different altitudes. The continental divide therefore has to be located in it. Combining Canadian and US regions is not a good idea. Due to different latitudes the snow melt days and daily energy vary considerably. A combined graph would only average these two out, blurring the time and magnitude of significant melt periods. I would possibly create another region for the Canadian Rockys to seperate them from the Canadian shield. Hi Sparkles, thanks for joining the search. Feel free to post any questions or findings you have from the data. SCE has now declined by about 1 million km2 in the last week or so to well below average as warmth headed North and East across the centre and East. Snow looks like continuing to retreat in the centre and east of North America until the weekend until cold returns to most of the continent. Snow Water Equivalent (SWE) also stalled on this day at close to +1 SD, and precipitation looks like being quite low over the next 5 days, and may fall as rain on the far NE seaboard. That is one crazy looking graph. Looks like the approaching ice age may be postponed for 2019. Very low snow cover in North America and East Asia. Europe on the other hand is above average. But according to my AWP model it doesn't matter much, because at December solstice the sun is too weak to signicantly take advantage of the low albedo. Only the USA had a noticable increase in absorbed solar energy. I'm on holiday until New Year, but daily updates should continue for all my Near Real-Time data. I saw that the snow cover extent graph (https://ccin.ca/ccw/snow/current) does not seem to be updated from 18-12 - is it usually updated daily? It is usually updated by about 9 or 10 a.m. GMT. But may still show old data. You may find that refreshing the page works, or even opening the snow map and the graphs one by one and refreshing each one. It works for me - sometimes. SCE looks like retreating a bit more for one or two days until c-c-c-c-old returns to Canada by next week. A big wet storm hits the North East on Friday/Saturday/Sunday. Much rain and much snow. This could increase or decrease SCE and SWE substantially depending on the balance between rain and snow.